Learning from Failure. The more it hurts the better you learn. I’ve heard lot of people recently going on about how necessary it is to fail. “Fail fast, fail forward”, “Learn the lessons from failure, and move on”, “Take risks and accept that some things will fail”, “Share your mistakes”. It’s all a bit worrying if you’ve spent your working life in organisations where failure (and particularly owning up to it) is something you’ve avoided at all cost, and you certainly don’t go public trumpeting the details of your epic fail. I do understand the value in encouraging a bit of well-managed risk taking, and the inevitable failure. 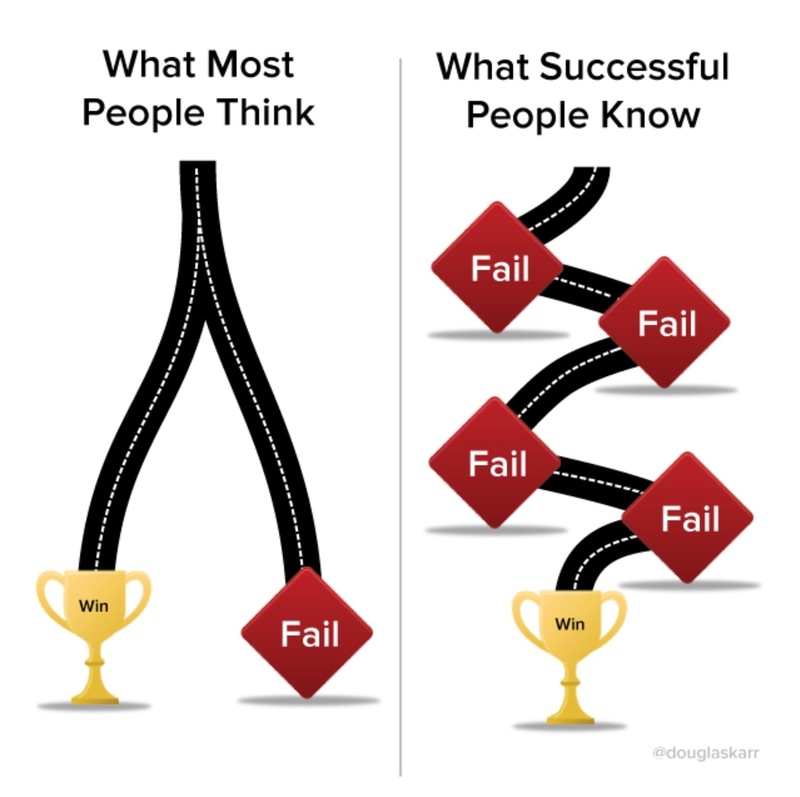 If the graphic that was popular on twitter recently (see above) is anything to go by, multiple failures are the best route to a successful venture. However, for me there is a key thing missing here, what does failure (let alone multiple failures) actually feel like? Also, how do you maximise the learning from failure? I think we need to be prepared for the emotional consequence of failure because, I have a theory: The more the failure hurts you, the better the learning. Let me explain from some of my own experiences. Low Pain Failure: A situation many will have experienced, the contract tender. You invest a significant amount of time in writing the tender proposal, submit it by the due date and wait for a decision. You get the call, sorry your submission wasn’t successful: your fees were too high, you lacked the relevant experience, other bidders offered greater value for money (delete as appropriate). All good feedback, you learn the lessons and will dutifully apply them to the next tender proposal. To be honest, there’s not much pain in these nowadays, it’s just a ‘consequence of doing business’. I probably felt more pain with the first few of these that got rejected. There certainly isn’t a massive ‘post mortem’ of hand wringing and ‘anguished why’s’ anymore. Medium Pain Failure: Someone rejects my clever idea. I’m asked to help someone solve a problem by contributing my thoughts and ideas. They then go away and do completely the opposite of what I’d suggested – in fact something I’d warned them against. My goodness, that hurts. Translating the pain of failure in these circumstances can take a couple of routes. The petulant teenager in me would like to terrible things like the “I told you so dance” around the wreckage of their daft idea that went wrong. A helpful and quite deep learning process, driven by the pain of the failure. Very Painful Failure: I do lots of swimming, pretty much every morning before work, generally a mile which I can manage in a respectable 32mins (it does vary). Over the summer I entered a mile long, open water sea swimming competition between Port Gaverne and Port Isaac in North Cornwall. I’ve never done this sort of thing before, but surely it all amounts to pretty much the same thing, doesn’t it? Well, I got it spectacularly wrong. After about 400m I’d convinced myself that I was going to drown and headed straight for the rescue boat, to extract myself whilst I was still capable of doing so. Just to add to my shame I was dropped off by the finishing line to wade ashore and meet the cheering crowds. I spent the rest of the day sulking in bed. The emotional pain of failure was immense…… to be honest it’s still gnawing away at me. What this has done though is drive some intense learning. I have committed to go back next year and complete the swim. The last two weeks have been all about asking swim buddies at the pool (and some complete strangers) what they know about sea swimming…. apologies to them if it feels like a bit of a grilling. This is intense learning and, by spring I reckon I will be a walking open water swimming encyclopedia. Next steps: Back down to the sea to put the learning into practice; look out Porthcawl. For many successful people and organisations accepting that things fail, and admitting it, might be a difficult thing to come to terms with. Saying we should accept failure and learn from it is easy to say, but quite a hard thing to do. There are emotional consequences. There may well be a link between the pain of failure and intensity of the learning (there was for me). The greater the pain the bigger the learning. A willingness to leave your comfort zone in the first instance is the greatest Challenge of all. I’ve been thinking about these. – Leave your comfort zone. Quite a bit here that fits in with the idea of Negative Capability. You might like this video of Bright Star, the film about John Keats where Negative Capability is explained. Fab. Suspect the more you care the more it hurts – and wholehearted caring makes the world go round. Caring about others the most important thing we can do. Fits in very nicely with the conversation yesterday. Was good to catch up. I do see the point, and reducing the emotional cost of trial and error is clearly useful. But, lets be fair, it’s all about winning isn’t it? There has to be a balance between winning, failure and learning. It’s about getting just enough failure to keep you keen and learning lessons and ultimately winning. And all the very best for it! I always admire these sorts of undertakings, like marathons and the like. Im sure you’ll learn lots! Well, yesterday I learnt about ‘sighting’ – it’s important to know where you are going. Wish I’d known that! How to deal with the sight of scary seaweed looming up from the bottom of the sea (to entangle you and drag you to the bottom – apparently it doesn’t) Definitely wish I’d known that. I don’t like to be a contrarian, but I couldn’t disagree more. Clearly you are trying to “win”, and you hope the failure to success ration will not be too high, but you will never know until you have succeeded, which (i) you may never do, (ii) you may rate differently when you get there, and (iii) other people may rate differently from you. All this makes your ratios subjective, liable to change over time and, of course, subject to confirmation bias. So, for example Edison supposedly made 10,000 lightbulb prototypes that failed before he got it right. so failure:success is 10,000:1, cetainly lobsided. So if that were you experimenting when would you have given up? What failure ratio would be tolerable? Of course in hindsight Edison was very successful, but if that were you, measuring the ratios, uncertain if it would ever come good, setting up experiment 500, would you be thinking “too much failure, ratio is not good, time to move on”? Tony said “I’m prety sure I do what I do due to the success to failure ratio being so lopsidedly biased to the success side of the equation” Now read http://thinkpurpose.com/2013/08/30/the-willie-sutton-rule/ (not my blog, no affiliation). So, I suggest you do it because you love doing it, not anything about ratios. Is ThinkPurpose right? I very much enjoyed the links to Think Purpose and Willie Sutton. It’s all worth a bigger conversation which I’d hope we can have more of. A bit of being contrarian is always a good thing and I appreciate your comments and arguments. – I think the question around when you accept failure and give up is a complex and highly context specific issue. – this is fine where there is some coherence to what you are doing, you are pretty sure it will work, you just need to keep adjusting, modifying, experimenting and trying new things as in the case of Edison. – in Tony’s world of business I suspect the profit and loss account will be a big factor that will push things towards the lopsided of getting a high ratio of wins. – All being well I will try to overcome that and move to the win, a personal one, not winning the race. I’m daft but not stupidly ambitious. Would be good to connect. Appreciate the feedback…. Having gone very public now I don’t think I have any options about completing the swim. My ability to weave a question about ‘do you know anything about swimming in the sea?’, is astonishing me at the moment. Distressingly there are quite a few ‘and they were never seen again’… stories about. Very true about the depth of how much you care pushing you onwards, despite repeated setbacks (aka failures). One of the other comments uses he example of Edison and the invention of the light bulb. As my father used to say “Success is not how far you’ve come, its how many obstacles you have overcome”. But ultimately I guess its about not loosing enthusiasm and also is giving up failure or just tactical withdrawal? Resilience and ‘getting up again’ after a setback has come up a few times since this post. I’ve read a bit as a result but need to do a bit more. I’ve learnt a few things which I wish I’d known 30 years ago. One thing….. do you know the secret of how you managed I listen to what your father had to say, and now use it in later in life? I’m desperately trying to get my kids to listen at anything I’ve got to say. Great post Chirs – my friend and I were only talking about this subject the other night actually. We thought that there was something there about the experiences people had already had to encounter (personally or professionally) and how they had dealt with them in the past that would enable them to go through this learning. Also, is there an element of natural tendencies towards optimism / pessimism and personal resilience that changes this process? Good luck with your sea swim! Have you done / could you do any lake swimming as in between phase of learning? Sorry it’s taken a week to respond. There does seem to be something in the idea that, having experienced previous failures it will help you deal with new ones. You could call this learning or resilience. Have a look at this weeks post for a link to the article on optimism and stoicism. It’s part of the link Mark sent me to the Museum of Failures. The article is about the Antidote to Happiness. Worth a read. Thanks the well wishes on the swim. Did you have a look at the Keats video about Negative Capability? A bit of lake swimming in that. Am a even more anxious about lake swimming than the sea. A phobia of weeds and watching the 2nd challenge in the Harry Potter Triwizard Tournament.